BLOEMFONTEIN, South Africa (AP) South Africa gave a strong indication it has turned a corner after two dark years as it overpowered England 23-12 in the second test to clinch their series with a match to spare on Saturday. The Springboks won just seven of their 13 matches last year, a run that ultimately cost coach Allister Coetzee his job, and were ranked as low as seventh just two weeks ago. But another impressive performance under new coach Rassie Erasmus at Free State Stadium allowed South Africa to rise to third in the World Rugby rankings and notch a sixth straight series against England without defeat. The only blotch on the home side’s outing was another soft start, as England scored 12 consecutive points in the opening 13 minutes. Both tries came from the wings as the visitors stretched South Africa out wide, with Mike Brown scoring on the left side before Jonny May crossed on the right. South Africa’s slow start mirrored its effort in Johannesburg, where it trailed England 24-3 after 20 minutes but ultimately won 42-39. ”I don’t know why we keep starting slowly, but the most important thing is the character of the boys. 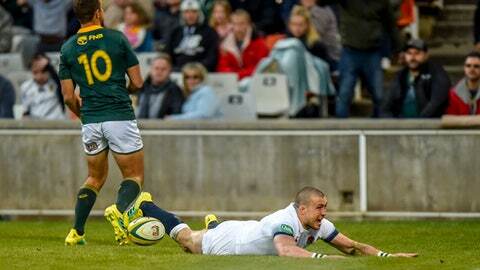 We keep fighting back from a dark hole,” South Africa captain Siya Kolisi said. Once the South African machine began rolling, England was barely given a sniff. After a smart break from prop Tendai Mtawarira, who made his 100th test appearance, man of the match Duane Vermeulen went on a typically rampaging run to score South Africa’s first try. Vermeulen cut inside to beat two defenders, slipped Maro Itoje and Ben Youngs, and carried Elliot Daly over the try-line. With scrumhalf Faf de Klerk marshalling South Africa and keeping England pegged back with accurate box-kicking, the pressure on the visitors began to tell in the rising penalty count. As England’s indiscipline once again let it down, flyhalf Handre Pollard kicked two penalties – the second of them from almost 60 meters – to give South Africa a 13-12 lead at halftime. After conceding 17 penalties in the first test, England went on to give up 13 on Saturday, including a penalty try that was awarded to South Africa in the 50th minute when the visiting scrum disintegrated on its own line. ”They were a different sort of penalties this week,” England coach Eddie Jones said. ”A lot of set-piece penalties this week and we conceded a lot of penalties in general play last week. It’s a bit like a broken car, you fix one thing and something else breaks. Flanker Brad Shields nearly hit back for England in the 59th minute when he was awarded a try by referee Romain Poite, only for it to be ruled out when video replay confirmed the ball was swatted from his outstretched hand. South Africa took full control thereafter. Pollard added a third penalty and could even afford to miss another as England faded away badly. Jones made a triple substitution, but when No. 8 Nathan Hughes was shown a yellow card for a professional foul with 11 minutes remaining, a fifth straight test defeat became inevitable for England. The third and final test is at Newlands next Saturday.